I first saw this species while doing some solo fieldwork in Mexico, at the terminus of an already dark and dreary day. Not enough sunlight for profound thought or for photography. 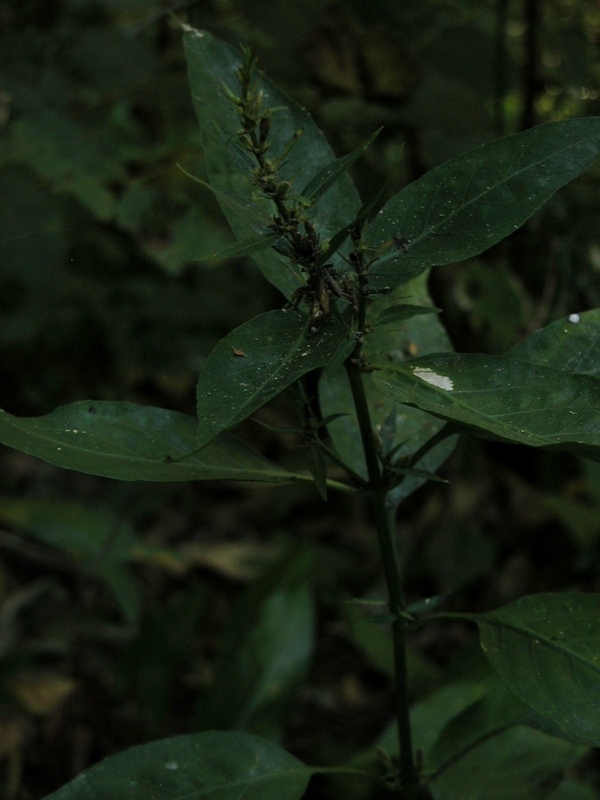 Nonetheless, I was convinced it was Ruellia metallica and that I was seeing this species for the first time in Mexico. Looking at my collection of this plant more carefully in the herbarium, it seems to consistently have more seeds per fruit and more slender fruits than does R. metallica (which is now affectionately known as R. terminale; see Tripp & McDade 2012, Brittonia). As it turns out, several other collections from this portion of Mexico also fit this pattern. With some additional research, I decided that these plants should be attributed to Leonard’s infrequently used name, Ruellia oaxacana. This species is genetically distinct from R. metallica/R. terminale, which was quite interesting to learn.